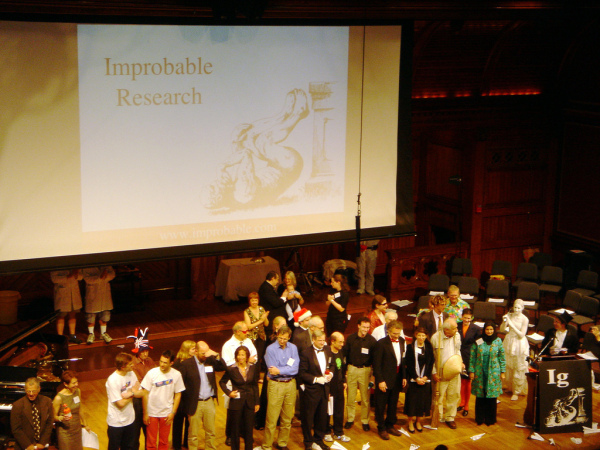 The Ig Nobel Prizes are a parody of the Nobel Prizes - awarded each year by the scientific humor magazine Annals of Improbable Research. They began in 1991 as a way to draw attention to projects "that cannot, or should not, be reproduced." It is a humorous event each October on Harvard's campus and the awards are handed out by genuine Nobel Laureates. CHEMISTRY: Mayu Yamamoto of the International Medical Center of Japan, for developing a way to extract vanillin -- vanilla fragrance and flavoring -- from cow dung. NUTRITION: Brian Wansink of Cornell University (from our article Is The 'Joy of Cooking' Fattening Us Up? ), for exploring the seemingly boundless appetites of human beings, by feeding them with a self-refilling, bottomless bowl of soup. BIOLOGY: Bart Knols and Ruurd de Jong of Wageningen Agricultural University for showing that the female malaria mosquito Anopheles gambiae is attracted equally to the smell of limburger cheese and to the smell of human feet. Jack Harvey, John Culvenor, Warren Payne, Steve Cowley, Michael Lawrance, David Stuart, and Robyn Williams of Australia, for their irresistible report "An Analysis of the Forces Required to Drag Sheep over Various Surfaces." C.W. Moeliker, of Natuurhistorisch Museum Rotterdam, the Netherlands, for documenting the first scientifically recorded case of homosexual necrophilia in the mallard duck. Arnd Leike of the University of Munich, for demonstrating that beer froth obeys the mathematical Law of Exponential Decay. Peter Barss of McGill University, for his impactful medical report "Injuries Due to Falling Coconuts." Buck Weimer of Pueblo, Colorado for inventing Under-Ease, airtight underwear with a replaceable charcoal filter that removes bad-smelling gases before they escape. Jasmuheen (formerly known as Ellen Greve) of Australia, first lady of Breatharianism, for her book "Living on Light," which explains that although some people do eat food, they don't ever really need to. Steve Penfold, of York University in Toronto, for doing his PhD thesis on the sociology of Canadian donut shops. Dr. Len Fisher of Bath, England and Sydney, Australia for calculating the optimal way to dunk a biscuit. Professor Jean-Marc Vanden-Broeck of the University of East Anglia, England, and Belgium, for calculating how to make a teapot spout that does not drip. The British Standards Institution for its six-page specification (BS-6008) of the proper way to make a cup of tea. Dr. Paul Bosland, director of The Chile Pepper Institute, New Mexico State University, Las Cruces, New Mexico, for breeding a spiceless jalapeno chile pepper. Peter Fong of Gettysburg College, Gettysburg, Pennsylvania, for contributing to the happiness of clams by giving them Prozac. T. Yagyu and his colleagues from the University Hospital of Zurich, Switzerland, from Kansai Medical University in Osaka, Japan, and from Neuroscience Technology Research in Prague, Czech Republic, for measuring people's brainwave patterns while they chewed different flavors of gum. Bernard Vonnegut of the State University of Albany, for his revealing report, "Chicken Plucking as Measure of Tornado Wind Speed." Anders Barheim and Hogne Sandvik of the University of Bergen, Norway, for their tasty and tasteful report, "Effect of Ale, Garlic, and Soured Cream on the Appetite of Leeches." Robert Matthews of Aston University, England, for his studies of Murphy's Law, and especially for demonstrating that toast often falls on the buttered side. George Goble of Purdue University, for his blistering world record time for igniting a barbeque grill-three seconds, using charcoal and liquid oxygen. John Martinez of J. Martinez & Company in Atlanta, Georgia, for Luak Coffee, the world's most expensive coffee, which is made from coffee beans ingested and excreted by the luak (aka, the palm civet), a bobcat-like animal native to Indonesia. D.M.R. Georget, R. Parker, and A.C. Smith, of the Institute of Food Research, Norwich, England, for their rigorous analysis of soggy breakfast cereal, published in the report entitled 'A Study of the Effects of Water Content on the Compaction Behaviour of Breakfast Cereal Flakes." Ron Popeil, incessant inventor and perpetual pitchman of late night television, for redefining the industrial revolution with such devices as the Veg-O-Matic, the Pocket Fisherman, Mr. Microphone, and the Inside-the-Shell Egg Scrambler. The Pepsi-Cola Company of the Phillipines, suppliers of sugary hopes and dreams, for sponsoring a contest to create a millionaire, and then announcing the wrong winning number, thereby inciting and uniting 800,000 riotously expectant winners, and bringing many warring factions together for the first time in their nation's history. Louis Kervran of France, ardent admirer of alchemy, for his conclusion that the calcium in chickens' eggshells is created by a process of cold fusion. Ivette Bassa, constructor of colorfulcolloids, for her role in the crowning achievement of twentieth century chemistry, the synthesis of bright blue Jell-O. The utilizers of Spam, courageous consumers of canned comestib les, for 54 years of undiscriminating digestion.